I bought the older InReach SE (on ebay for about $200) It doesn't have the map display features of the Explorer; it requires a bluetooth connection to an EarthMate app on my cell phone. But anyway, I have both a Spot an SPOT II that I'd like to sell (for almost nothing if anyone wants either one) The SPOTs require an annual subscription, which in the long run costs more than the unit. The InReach has various levels of subscription, more flexible, but no way less than the SPOT subscription. My cheapo level with InReach is $15 per month if I don't use it. If I use it on a trip, they ding me a few bucks extra, since each message costs $.50 or something like that. Tracks cost a dime each. But anyway, I bought the InReach because of its 2-way texting capabilities. That gives me (and my family) peace-of-mind that I won't just vanish on a trip, and can let people know if I'm in trouble. From mountain tops, the satellites are easily accessible, so messages transmit right away. Down in canyons, you might wait 20 to 30 minutes before the unit can "see" a satellite to send/receive a message. SPOT signals are similarly temperamental. I use the inreach explorer+ and love it. I have an inReach SE for a few years now. It works pretty good just about anywhere unless you get deep in thick trees or deep in a box canyon. The problem that I'm having is with technical support. The inReach line was sold from DeLorme to Garmin, and I don't think that it is clear as to which is doing the support. That leaves the customer dangling. I've used a spot for a couple of years, but found a smoking deal on an original inreach explorer (not the new garmin +) and made the switch last month. So far I've found the inreach tracks better than the spot. One rudimentary test I did was to have both devices sitting on opposite sides of my dash and logging as we drove from crater lake to my inlaws place in paradise. There were a bunch of gaps in the spot track, like no pings for 40 min when set to 10 min pings. The inreach clocked a location ping every 10 min without fail. The inreach proved handy last week while I was at a scout camp with my son. No cell coverage or phone access other than a payphone. I was able to send a message to one of the parents that was coming the next day to help shuttle scouts home that we would be ready an hour earlier than originally planned. Worked out great. So far so good. So far I've found the inreach tracks better than the spot. One rudimentary test I did was to have both devices sitting on opposite sides of my dash and logging as we drove from crater lake to my inlaws place in paradise. There were a bunch of gaps in the spot track, like no pings for 40 min when set to 10 min pings. The inreach clocked a location ping every 10 min without fail. I understand your experiment. It would be better if you repeat it, but this time reverse the units from right to left sides. I've used various GPS receivers in cars for about twenty years now, and I've discovered all sorts of little things about GPS reception that you never would have imagined. The issue here has little to do with GPS, but rather the communication satellites that the two systems use. 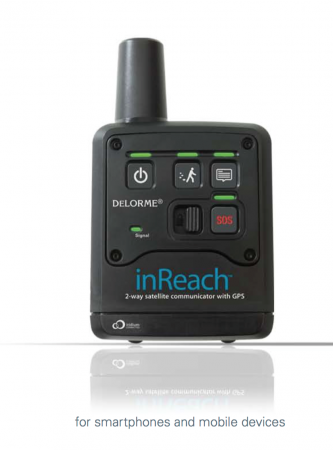 InReach uses the Iridium Satellites, while Spot uses Globalstar. The Iridium is generally considered to be better, although I am sure others may disagree. In your example the spot was unable to contact a satellite, while the InReach was. Most likely the GPS coordinates would have been similar (provided they sampled at the same time). I've switched to InReach, too. The reliability is helped in that the InReach "knows" when a satellite is in reach (no pun ) so it waits to send your location (I'm thinking it holds it until it can send). Spot just randomly sends a signal every 5 minutes, and it has no idea what is "available" in the sky. I'm out floating on the Pacific as I type this. Loaned the InReach to a friend's son. Son returned it -- he put it in a flower pot outside my door, rather than ringing the doorbell. I left for the airport before I got his message. So I can't send out any signeals this trip. Would have been fun. I started using InReach in 2012, and have "never looked back". It has been rock solid reliable since they got the bugs out of the iPhone application (or could be I finally figured out how to use it:-)). As you can see mine is the old design, but I prefer it since i think it is indestructible. Wow, that looks like something I'd want. Small and compact. The newer Garmin ones are too big and I really don't need a full screen if I can pair it with my iPhone. Shame it's not made any more. I'll have to do some digging on ebay and elsewhere. There are two available on ebay now, $25 and $36. I've been a big fan of the inReach for a few years. I first rented an inReach SE when I took my 6-year old out backpacking. I bought an inReach Explorer the next year, and it gives my wife considerable peace of mind to track our location and know we can contact her and authorities if we get into a bind. The 2-way messaging has also been very useful for us as we've done some off-trail trips and have had plan changes due to weather, etc... Over the three years I've showed it to many other hikers/backpackers, and they've all been impressed. I have found the tracking to be very accurate. I even used it last summer to navigate a series of unmarked forest roads out of the national forest when I was driving out of cell range to get back home. The variety of subscription plans has also been a plus, as I typically only get out for 2-3 trips each year in a 2 or so month span, though I'm considering taking it out for long day hikes now as well. I have the Explorer Se and it's awesome. Mrs's feels better, I can route find better, maps are really good, and I even use it on my kids bike trips to know where she is located. Generated in 0.378 seconds in which 0.369 seconds were spent on a total of 14 queries. Zlib compression disabled.